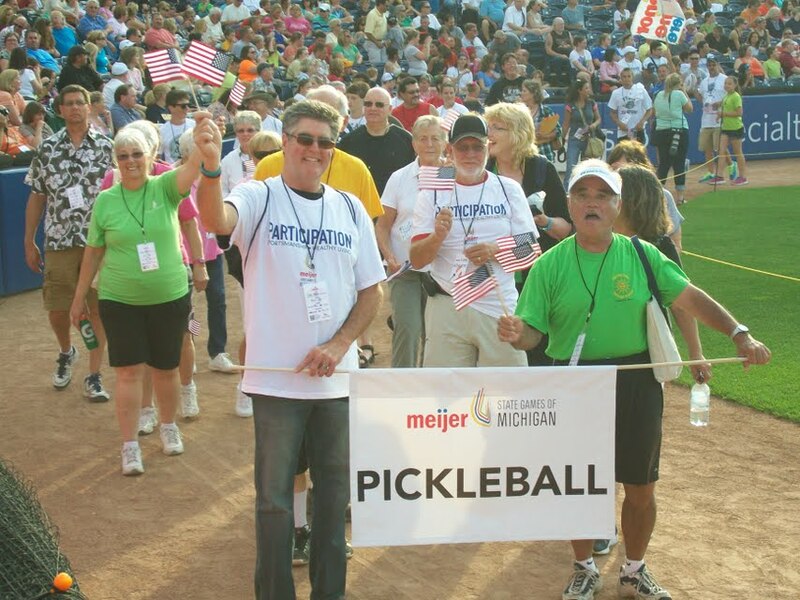 Meijer Michigan State Games 2013 – Team Toledo Results – Pickleball is Thriving in Northwest Ohio! This past weekend the 2013 Michigan State Games were held. It is an amazing event with an Olympic Feel. This year there were over 6,500 athletes competing in 34 sports. Pickleball had 252 participants this year and again Team Toledo was well represented on the medal stand. Charlie McKnight leading the way in the opening ceremonies. Tim Hacker and Charlie McKnight brought home gold after a knock down drag out battle with a very great team from Florida. They were knocked into the losers bracket by the team they eventually beat, so they had to not only beat them 2 out of 3 games but also an additional game to 15. Way to go Tim and Charlie on bringing home the gold in the Men’s Doubles 50+ bracket!!! Some sad news also came out of this year’s event. Tom Wells badly injured his ankle while playing in the third round of the Mixed Doubles 5.0 bracket. In spite of his injury Tom and Marsha Koch won the bronze medal in the Mixed Doubles 5.o bracket. Wishing Tom a speedy recovery! Marsha Koch and her partner Jessica LeMire (Grand Rapids, MI) won the gold in the 5.0 Women’s Doubles bracket. They went undefeated in the first three rounds, not losing a game. In the gold medal match, they lost the first game to the very strong and respected team of Yvonne Hackenberg and Martha Wasserman, before winning the next two games and the gold medals. Susan Wiartalla and her partner Merrianne Murphy took the bronze medals after losing to the Hackenberg/Wasserman team in a close three game match in the silver medal match. Wow 252 pickleball participants from Toledo, that is awesome. It is exciting to see the sport of pickleball growing in Ohio and Michigan. Hi Anna, the 252 participants were from all over the country. There were only 6 participants from our Toledo Club. Oh, yes, yes I misread the article!